It was postulated that antibiotics including macrolides could be used for the secondary prevention of coronary heart disease but recent studies showed that macrolides increase the cardiovascular risk. We aimed to review the evidence of cardiovascular risk associated with macrolides regarding duration of effect and risk factors; and to explore the potential effect of statins for the prevention of cardiovascular events as a result of macrolide use. Several electronic databases (PubMed, EMBASE, Cochrane library) were searched to identify eligible studies. Observational studies and randomized controlled trials that investigated the association between macrolides and cardiovascular events in adults aged ≥18 years were included. A meta-analysis was conducted to investigate the short- and long-term risks of cardiovascular mortality, myocardial infarction, arrhythmia, and stroke. Methodological quality was assessed by the Newcastle-Ottawa scale and the Cochrane Collaboration’s tool. The body of evidence was evaluated by the Grading of Recommendations Assessment, Development, and Evaluation guidelines. Observational studies were found to have a short-term risk of cardiovascular outcomes including cardiovascular mortality, myocardial infarction, and arrhythmia associated with macrolides but no risk was found in randomized controlled trials. However, no association for long-term risk (ranging from >30 days to >3 years) was observed in observational studies or randomized controlled trials. The included studies reported different units of denominators for absolute risk and used different outcome definitions, which might increase the heterogeneity. More studies are required to investigate the short-term cardiovascular outcomes associated with different types of macrolides. Future studies are warranted to evaluate the effect of statins for preventing excess acute cardiovascular events associated with clarithromycin or other macrolides. 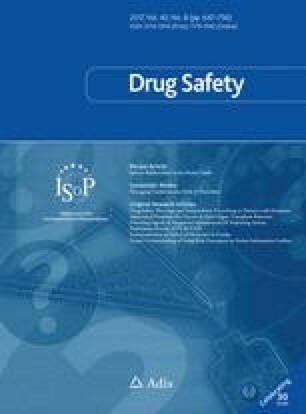 The online version of this article (doi: 10.1007/s40264-017-0533-2) contains supplementary material, which is available to authorized users. AYW, EWC, AJW, and IW were responsible for the conception and design of the study. AYW was responsible for the process for selecting the study including screening. AYW and SA determined the eligibility and inclusion of studies in the systematic review and meta-analysis, extracted the data, and performed the quality assessment independently. AYW, EWC, SA, AJW, and IW contributed to the analysis and the drafting, revision, and final approval of the manuscript. All authors were responsible for interpretation of the data. AYW is the guarantor of the review. EWC was funded by a Small Project Funding, Committee on Research and Conference Grants from the University of Hong Kong for this project (No. 201409176255). The sponsor had no role in the study design; collection, analysis, and interpretation of the data; the writing of the article; or the decision to submit the manuscript for publication. Angel Y. S. Wong, Esther W. Chan, Shweta Anand, Alan J. Worsley, and Ian C. K. Wong have no conflicts of interest that are directly relevant to the content of this study. Higgins JPT, Green S. Cochrane handbook for systematic reviews of interventions. Version 5.1.0 [updated March 2011]. The Cochrane Collaboration. http://www.handbook.cochrane.org. Accessed 8 Feb 2017.